An amazing place, amazing stories full of eccentrics all in some strange competition to out do each other. It is a unique landscape of piles of white dirt, old shacks and mining equipment with the characters of the town interwoven in a harsh, unforgiving environment. The locals have a love/hate relationship with the tourists and you do get the impression that many would be happy if things returned to a simpler, quieter town. Whilst I was soaking at the artesian bore the locals commented that the water was much hotter a couple of days ago which was good as it kept the tourists away. Shane and I go fishing for a day at Walgett in the Barwon River, one of Shane’s favourite spots. Unfortunately it is our usual record of just catching carp after carp with one surprising little perch that managed to get hooked and naturally had to be released. The countryside is dry, really dry with not a blade of grass to be seen. On the other hand the birdlife is prolific and it is a wonderful sight to see a red tailed black cockatoo majestically circling above me – truly spectacular. Not a blade of grass or green pick to be seen – so dry. The Barwon River, many happy memories for Shane and the boys. The next day Shane can’t resist another crack at fishing and I head out on a tour around the ‘Ridge’. It is an education on mining, the heartbreak, the jubilation and lots of great stories. I know I couldn’t do it and when the dig next door to you pulls out $12million worth of opals in one day and you are lucky to get $50.00 worth in a month of Sundays it must be just devastating. I guess that’s why so many x miners are the ones driving the tour buses around. Here are some pictures of the incredible Chambers of the Black Hand Gallery and mine I visited – what do you do when you can’t mine – you pick up a butter knife and steel wool and start sculpting. Me with a nobby – could be holding a million bucks! The population is unknown and people can just disappear. We are told the police have been looking for a fella that has been missing for about 3 weeks. ‘Ratters’, the name given to the low life’s that raid camps/mines for opals mostly under the cover of darkness, are often dealt with by local vigilantes and in the best case scenario are booted out of town never to return, worst case they are never seen again. Opal mining is a hit and miss affair with no known way of telling where the precious stone might be hidden but once bitten by the bug there seems to be no known cure. The stones are as colourful as the local people and just as fascinating. Local artist, John Murray, has an incredible talent for turning these colours into art with humour and great detail that truly captures the special bond he has with this place. The water at the communal baths is hot, very hot coming up from over a thousand feet below ground but I still enjoy my daily dip and chat with my fellow bathers. Stanley – tall and proud, ready to welcome you to Lightening Ridge. Fred Bodel’s Camp – just a glimpse of what the home of mining looks like – and this was luxury – still is! Fred Bodel’s mining boots – he and them are now retired. This entry was posted in Travelling and tagged Barwon River, john Murray, Lightening Ridge on May 28, 2015 by peakesj6. The home of Cubby Station, the largest irrigated cotton property in Australia – in a high river year they store an incredible amount of water with a capacity as big as the Sydney harbor and grow 50,000 acres of cotton. The town itself boasts a good size grocery shop, a butcher, baker and clothing store due to being so close to the station. Shane and I head to a lovely spot on Balonne River to try our hand again to catch a fish. Alas it is another occasion to pull some more of the pesky carp from the river. A couple of young chaps fishing up the river are quite impressed but didn’t accept our offer to help themselves to the fish. They have pulled up in a fire truck and we wonder if they are still on duty. The Balonne River. Waiting, waiting, waiting – nothing but carp. The caravan park is fantastic with the owners happy to help out with anything you need even taking the time out to show us aerial shots of cubby station and some brilliant harvesting photos. 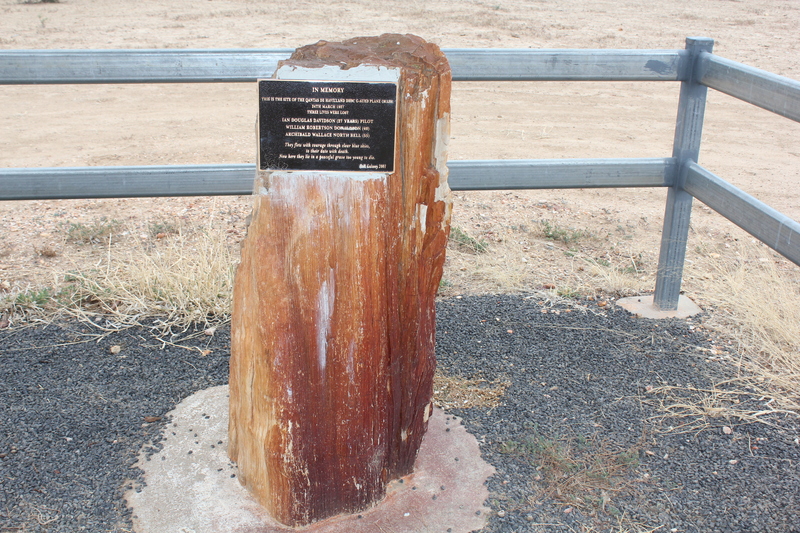 This entry was posted in Travelling and tagged Balonne River, Cubby Station, Dirranbandi on May 26, 2015 by peakesj6. Talk about being made welcome, everyone from the pub to the club and everywhere in-between we overwhelmed with hospitality. We are told to ‘come on over’ to the bowling club for dinner by one of the travellers at the camp. His wife is singing and it seems like a good idea so off we go. The club is run by all volunteers from the cooking to the bar work. Barry tells us some fishing spots to try with a wry smile – certainly not giving away all his secrets. It’s a wonderful night with many of the locals sharing tales of living here. The next morning I head to town and find the best information center/gallery/museum so far on this trip. The lady is enthusiastic about the town and the history plus there is a fantastic 25lt aquarium with a variety of native inland fish. 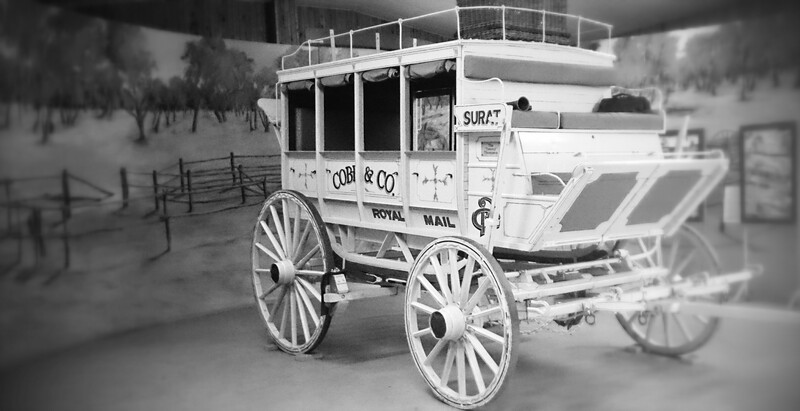 I loved this museum wrapping around the towns history with the Cobb and Co coaches that stopped and changed over here. A great section on quirky tales starts you off from the first policeman assigned to the town to then being the first registered death, ghost stories, bullock teams that disappeared in the river never their load, cart or bullock seen again – fabulous stuff – loved it! Shane and I spend the afternoon fishing in the Balonne River– it is the inland fishing capital of outback Queensland after all. After getting organized, throwing in a line and starting my crossword I get a bite and to our surprise I have a Murray Cod twisting and turning on the end of the hook. Sadly it is not legal size so a quick photo and back it goes. Unfortunately, that was the only action we saw for the rest of the afternoon. Although a fellow fisherman comes by for a chat and tells us a great story about winning the carp catching competition last year by jumping into a lagoon that was drying up, catching them by hand and chucking them onto the bank. They had two bags chocka block full and won a thousand dollars. Apparently they have changed the rules for this year – the carp must be caught with a hook. We end our time in Surat with a walk along the river, definitely well worth the visit. This entry was posted in Travelling and tagged Balonne River, Surat on May 24, 2015 by peakesj6. On the way to Charleville we feel like a couple of twitchers on the loose. The rain has brought out the birds and we are so fortunate to see a wedge-tail eagle, kites, emus galore, crows, galahs of course and a couple of bush turkeys – a great treat. On arrival it is quite damp under foot, which has the locals jumping for joy, but makes some activities less than desirable. The clouds clear a little, the sun is trying to make its presence known and we really want to stretch our legs so a big walk is planned for the afternoon. We walk for a couple of hours but our favourite section is the river walk along the banks of the Warrego. 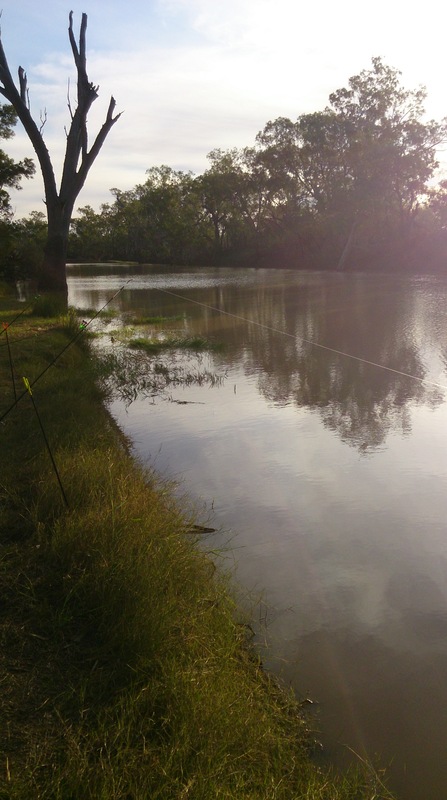 Although only water holes at the moment the one here is large, long and deep – Shane is almost tempted to try fishing but decides the roads in are too boggy. Today, due to the rain, the trunks of some trees look black and add another dimension to the bush set against a grey stormy sky with freshly washed leaves shiny green. We were hoping to have an evening with the stars as from 5pm until 7 the sky is clear and bright but sadly just before the show was about to start the clouds came over and the cosmos viewing was closed down. Charleville is full of things to see and do as they really do cater for the ‘grey’ nomads – we just happened to choose a starry encounter on the wrong night. This entry was posted in Uncategorized and tagged Charleville, Travelling, Warrego River on May 23, 2015 by peakesj6. It’s true everyone has a wave for you out here and just adds to the friendliness of outback Queensland. We set out to explore Blackall starting with a walk and we are delighted to see a pair of Brolgas down on the common enjoying the overflow from the bore water pump. Our main reason for stopping here is to hear the story of Jack Howe the best shearer in Australia. It is on record at Alice Downs Station that on the 10th of October 1892 in one day, 7 hours and 40minutes to be exact, Jack blade shore 321 sheep – that’s with things that look like over-sized scissors, just by hand, no motorized shears here. He should have sheared for 8 hours and if his fellow shearers hadn’t been mucking around trying to slow him down it would have been a lot more. In the same year he also set the record for machine shearing which was a mere 237! 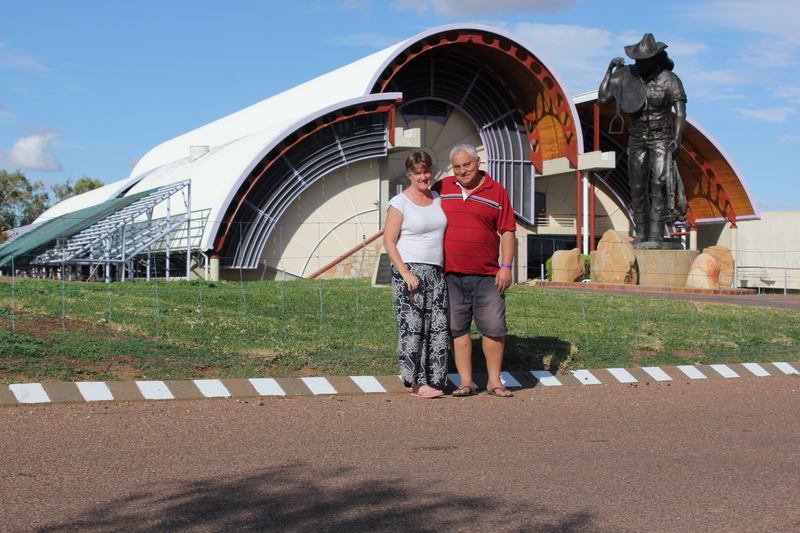 Barry Muir runs the small museum in Blackall just behind Jack’s statue and is passionate about his subject and has many, many stories to tell. Barry is married to one of the family so everything is said with the unmistakable inflection of pride. Jack was a formidable man, had the biggest hands I’ve ever seen and the only person he was ever scared of was his wife. He went on to buy a pub, was part of the early years of the labor party had 10 children and sadly died at 59. 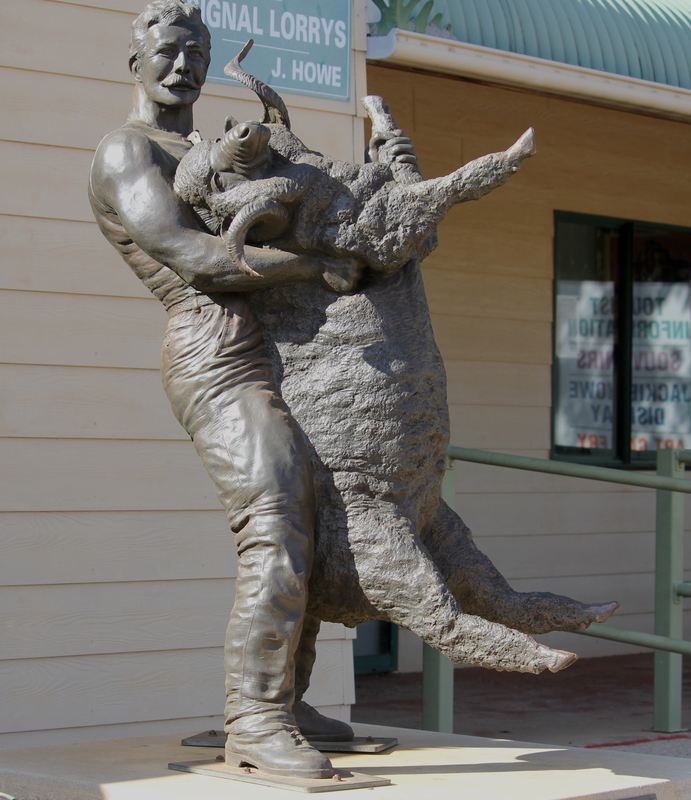 Jackie Howe, depicted here carrying the sheep across the boards – in those days they couldn’t be dragged. We enjoy a beer at the Barcoo and head to the butchers – now if anyone is coming through and wants some meat the Blackall Butcher is fantastic. We even get some pressed tongue, made at the shop and it was very nice! This entry was posted in Uncategorized and tagged Blackall, Jack Howe, Travelling on May 21, 2015 by peakesj6. Long looked forward to and anticipated we are finally here at Longreach. Our introduction is a challenging one…….. to fit the caravan into a very small park with wall-to-wall vans. Thankfully Shane is an awesome reverser. The good thing is that everyone here is super friendly, despite the tight conditions, and our friends from Bourke, Martin and Carol and happy to see us. The Thomson River looks good, the weather is a lovely warm 28′ and happy hour extends into the evening with plenty of people to swap stories with. There are so many things to do here you could drop $1,000 in just a couple of days without blinking – Quantas, Cob n Co, station tours and river cruises. We choose one thing – entry to the Stockman’s Hall of Fame with dinner and a show. Not being a real fan of museums we find the Hall of Fame a little under whelming. So much to read, poor lighting and with some of the displays not open/working did not help. Still, the Royal Flying Doctors display was great with short films to enjoy and the somewhat eerie looking stockman talking over his campfire was a highlight as well as the film showing RM Williams and some local stockmen and women. On the other hand we thoroughly enjoyed the nighttime show and the generous roast dinner was superb. A great show with fun, laughs and some very clever animals. Shane tries his hand at catching a fish a river with no carp for the next couple of mornings but apart from some decent bites his record stays in tact – 0 fish! Maybe that spot near Roma is the go. This entry was posted in Uncategorized and tagged Longreach, Travelling on May 20, 2015 by peakesj6. Shane was really looking forward to fishing in the Barcoo but it seems that there has been a considerable lack of rain and things are not looking good. Just the Thomson at Longreach to try out now. We are staying in a very quiet little bush caravan park and have been made very welcome by Daphne. Shane reckons she saw us turning in 200 meters up the road and came running out to greet us before we changed our minds. Daphne is a great representative for the area and has a wealth of knowledge to share with great stories to go with it. Getting here just after 2 we have plenty of time for a walk along the banks of the Barcoo River, which now consists of a string of water holes rather than continually flowing. Along the walk there is a small memorial to a plane crash that happened in 1927 where the pilot thought he could land on the football field but didn’t take into account the fence. Sadly he tried to get back up in the air but stalled the plane and it plummeted to the ground. He and two others died in the crash, which happened to be a Quanta’s plane – apparently not officially a passenger flight so doesn’t count on their unflawed safety record. It is an interesting little town and I get an education about the river systems in the area from Daphne. Lots of information but I liked this little fact. The Barcoo River meets the Thomson River, which then flows into Coopers Creek at Windorah. Apparently the only place in the world where two rivers make a creek. This entry was posted in Uncategorized and tagged Barcoo River, Tambo, Travelling on May 18, 2015 by peakesj6.